The Ludger Mintrop Award 2015 is presented to Meng Heng Loke and his co-authors Torleif Dahlin and Dale F. Rucker for their paper "Smoothness-constrained time-lapse inversion of data from 3D resistivity surveys", published in Near Surface Geophysics, volume 12, issue 1, February 2014, pp. 5–24. Håkan Rosqvist, Tyréns AB, is invited to the Nordic Biogas Conference, 27-29 August, 2014, Reykjavik to give a talk on Landfill Gas Production. MaLaGa was presented by Magnus Lindsjö from Tyréns during the Future Day at Sätra Gård in Stockholm 17/5. Formas has granted Tyréns, Lund University and partners financing for the project "Geoelectrical imaging for site investigation for urban underground infrastructure” under the programme "GeoInfra-transparent underground facilities. Sustainable development of urban underground infrastructure. " The project team includes Lund University – Dept of Engineering geology and Quaternary geology and Aarhus University – Hydrogeophysics group. The project budget is 700 000 Euro, of which Tyréns contributes with 170 000 Euro. The project has developed from the MaLaGa project and is amongst other aiming for further improving and developing techniques concerning detection and visualization of contaminants in soil using geoelectrical imaging techniques. The Tyréns MaLaGa-group will mainly contribute to the project by in detail process, analyze and interpret the data from field data collected by within the project further developed resistivity and IP techniques, focusing on characterization of contaminants, chemical content and geological features in urban areas. The main challenges in urban areas are expected to be the noisy environment. The project period is 2013-2016. The major infrastructure project Stockholm bypass will be the main test site. A method for detecting methane gas from old landfills have been developed by the Swedish Gas Centre, reported by the newspaper Energigas. The technique is based on electrical measurements made at the surface and makes it easy to find gas leaks that occur when old household waste decomposes in oxygen-free environment. Methane is a very potent greenhouse gas that contributes to climate change if it leaks into the atmosphere, but by collecting the gas, you can instead produce biogas for vehicle fuel. Results from MaLaGa were presented the 23rd of October at the session Landfill mining I: prospecting for valorization of deposited material and energy resources (special session) of the GIN conference. Our presentation focused on the potential of geoelectrical methods to separate between different types of deposited waste, and results from the Stena Metall pilot project in Halmstad was shown. The other authors presented prospecting methods based on soil sampling and historical records, and it was during the discussions concluded that geophysical methods and soil sampling could complement each other in an effective manner in future projects. The session Landfill Mining II: Approaches for facilitating implementation of landfill mining initiatives treated social, political and economic aspects on the matter. Landfill mining is a relatively new area of interest and has not yet become common practice. There are still several questions at issue, it is for example not obvious who the stakeholders are, neither what the economic costs or benefits a full scale excavation and extraction of materials becomes. We are looking forward to possible collaboration with new found collagues in future research projects. 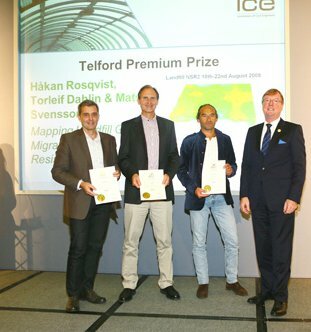 We are happy to announce tha the MaLaGa team has been awarded the Telford Premium Award for our paper on landfill gas detection using resistivity monitoring, by ICE Institution of Civil Engineers. The new MaLaGa web is being presented to the team.